destroy your base. What are you going to do about it? Well, simply teach them a lesson for going against you. archers or simply upgrade your army. archers, I'd say that it is quite the challenge. 1.2 - More Enemies, some text changed, no tribute text, and less starting soldiers. Thanks for downloading this (and reviewing) If i had the time, i would edit this to the extreme, however i can't. I may not be perfect, but what are you to expect? The game was fun, I enjoyed it quite a bit. However, the game wasn't fun enough for me to shout in joy. The beginning progressed smoothly and then I found myself confronting an army of Huns. The massacre began and what I thought would be a tough battle, was an easy one. It was easy, even after testing on Hard. Also I was able to prevent the Tarkan attack by sending troops to stand on the spawn Tarkan spawn points, which made gameplay very easy. I would give the game a 4 in Playability unless it was tediously easy. That took away some fun. In terms of skill, you could put me somewhere between an average player and a veteran. The first time I played, the enemy managed to break through my palisade but then I retreated behind the walls. That made every frighteningly easy. Even the mangonels, touted by the author to be challenging were easily destroyed. 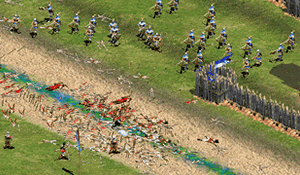 The longbowmen garrisoned in my towers easily overcame enemy forces. Few got past the walls; yet those who did quickly perished in the rain of death that ensued. The second time I played, I walled of my base but then the mangonels threatened my troops. The scenario requires an extent of planning and strategy but ultimately, is easy to finish. The enemy AI is unintelligent and cannot efficiently mount an assault. That makes the game easier. Another thing that hurts the scenario the most though, is the ability to exploit a weakness in the scenario and prevent many enemies from attacking. Like I noted before, I sent troops to stand on the spawn points of the enemy Tarkans. I suggest the author of this map to fix this by ensuring that the spawn points are heavily guarded. Well, I'm giving this scenario a 2 in balance. Too easy. The battle seemed to be impossible in the beginning but surprisingly turned out to be easy. The game lacked in creativity. The theme, which is defending against a marauding army is quite common. I can't say much except for the fact that the scenario lacked creativity. I like the use of triggers though. I didn't encounter anything wrong with them. I also liked the fact that the enemy would improve and slowly send in tougher troops. My suggestion? Improve on the story and instructions and redesign the map by adding some eye candy and making it realistic. It wouldn't hurt to add some history, some map tricks and some sounds though. The map area where the game is played is very small and doesn't consume much of the map. The map lacks terrain blending, eye candy, gaia units and basically most of the map area is grass. There is usage of elevations so that's a good start. The game has simple, straightforward instructions. These instructions though, don't help with much and the only thing you need to know is that you need to kill three thousand enemy troops. There is no story. To the author : I had a lot of fun with this scenario of yours. I believe that you can and should improve upon it. 1. Make the game harder. 4. Add some special tricks. 5. Make some sort of story. 6. Make the game longer. Finally, I enjoyed this map. It has problems which I have noted. I strongly suggest that the author improves the map or make a better, bigger one. You can download it if you want. I did and the download does not take long. If you are really looking an excellent map, look elsewhere. I was truly shocked when I finished testing the game and read that the author found it hard. I've made a review. It will probably be approved in a few days. Great concept. I found this scenario to be too easy. Map design isn't great either. Sorry this map isnt good enough. I dunno, it was the first triggered map that i have made so i don't really know any tricks or helpful strategies in making a better version. Sure, it got a below average review score, but at least i get a review!